Steampunk Girl, Panic Attack, Lives at Home and Love Me, Love My Cats! 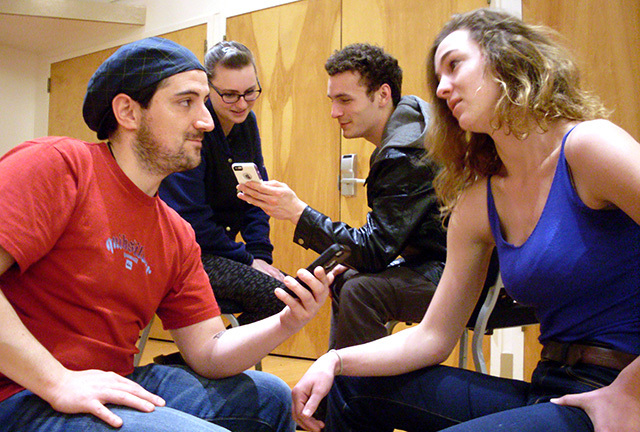 are a few of the characters enacting a frantic contemporary mating ritual in the comic opera “Speed Dating Tonight!” performed by the HSU Opera Workshop for four performances beginning Thursday March 24 in Gist Hall Theatre. It’s musical chairs for lovers as 15 hopefuls in a bar introduce themselves (some truthfully, some not) with a five-minute time limit, and the plot thickens along with the comedy. “Laughing together is a wonderful way to explore the culture of the modern dating world,” said director Elisabeth Harrington. The Opera Workshop performs “Speed Dating Tonight!” Thursday through Saturday, March 24-26 at 7:30 p.m. and Sunday at 2 p.m. in Gist Hall Theatre at HSU. Tickets are $10 general, $5 seniors and students, $3 HSU students with ID, from HSU Box Office (826-3928) or at the door. More information: http://HSUMusic.blogspot.com. Directed by Elisabeth Harrington, produced by HSU Music Department.